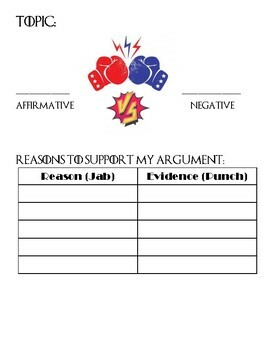 Do you want to encourage your students to form an develop an argument? It's easy to do with this NO PREP debate outline template! I usually show a video that describes the different parts of the debate, and then I relate it to boxing because my cousin is a professional boxer. The students love to form their own opinions about whatever they want and go head-to-head in battle, debate style!